The Lord Jesus is my rock, and in him only do I have hope. He is the foundation stone and by him all things cohere. Colossians 1:17 And he is before all things, and by him all things are held together. He is the only reason this earth exists and the only reason why God is saving it, despite mankind’s continual rejection of Him and trust in their own wisdom and power. It’s because of Jesus we exist and only Jesus can save mankind from impending doom. 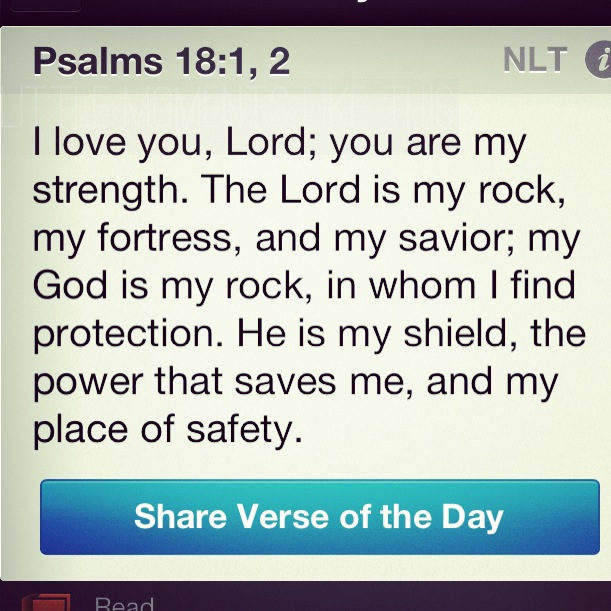 He is my rock and I am standing firm. I Corinthians 16:13 Watch, stand fast in the faith, be men, be strong. There are few things that are certain in this world. Mankind longs for the day when people live in peace and prosperity, but he never achieves it. Placing your hope in politicians who never do what they promise is not the answer. Trusting in government to act in the best interest of people leads only to disappointment as our freedoms slowly erode. Believing money will provide a meaningful life without strife is also fallacious. What man really wants he can never achieve. It is those things that God only provides and that only God can bring to pass. The elite in this world have been totally deceived. They seek to bring in a new world order with themselves in control, reducing mankind to a manageable population and much-limited rights. Have you seen the Georgia Guide Stones? They tell the story very clearly. Read the guidelines for yourself in the image below. There are over 7 billion people presently on this planet (2014) but according to these ‘commandments’ only 500 million is an acceptable number. It makes you wonder how ‘they’ will purge the earth of the other 6 and one half billion people to get down to the number ‘they’ feel is the largest population that can live harmoniously. Items 2 through 10 may seem good on the surface, but look at the control to bring them about. In number two, limiting reproduction is the only way to achieve number one. Number four’s ‘tempered reason’ will not allow “Jesus is the only name by which we must be saved. If you trust that ‘fair laws’ and ‘just courts’ will prevail I’m afraid you’re just dreaming. I could go on but these highly coveted dreams of mankind fall short of what God has in mind for the human race. Psalm 146:3 Do not look to nobles, nor to mere human beings who cannot save. Man will always let you down. The Bible says every person is a liar. Coveting (inordinately wanting something that belongs to someone else) is perhaps the most widespread sin of humanity. 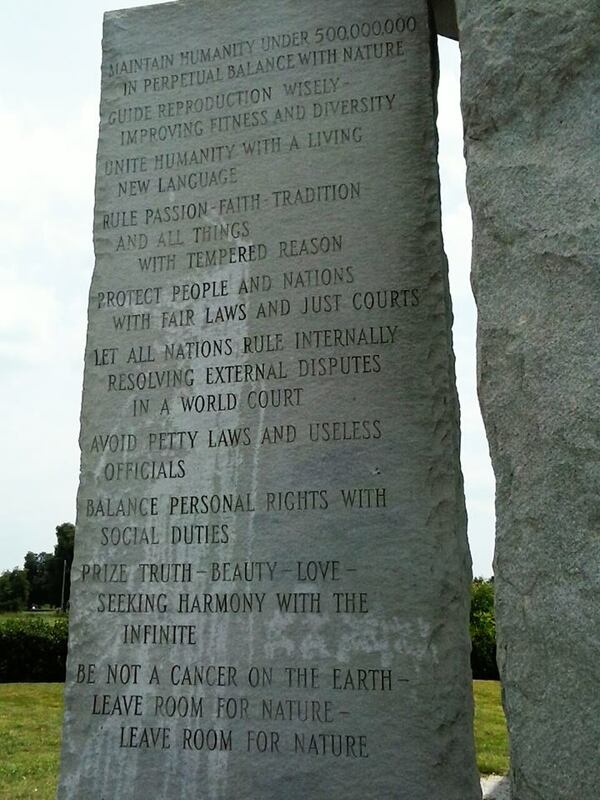 I wonder if those who would put mankind under rules such as those in the Georgia Guide Stones are free of covetousness. It seems to me that the elite are engaged in social engineering that allows them to stay at the top and control everyone else so they can have all the power and glory themselves. Normally, after the resurrection, Jesus is described as sitting at the right hand of God. Stephen saw him standing at the time he was about to be stoned to death. That tells me Jesus stands for his people. Don’t worry, Stephen will be raised when Christ returns for the church and those who killed him will be judged. Just because Jesus didn’t deliver him then doesn’t mean he won’t when all is said and done. There’s a big surprise coming for many people who do such things, thinking they do service to God when in fact they are serving he who oppose all truth. Jesus is my rock in whom I put all my trust. I don’t trust in human beings or in myself. I trust Jesus. Who do you trust? I hope you are not one whose eyes were filled with tears and whose heart leaped for joy when President Obama was elected, thinking he was the savior of the United States. I hope you’re not one who trusts in princes. 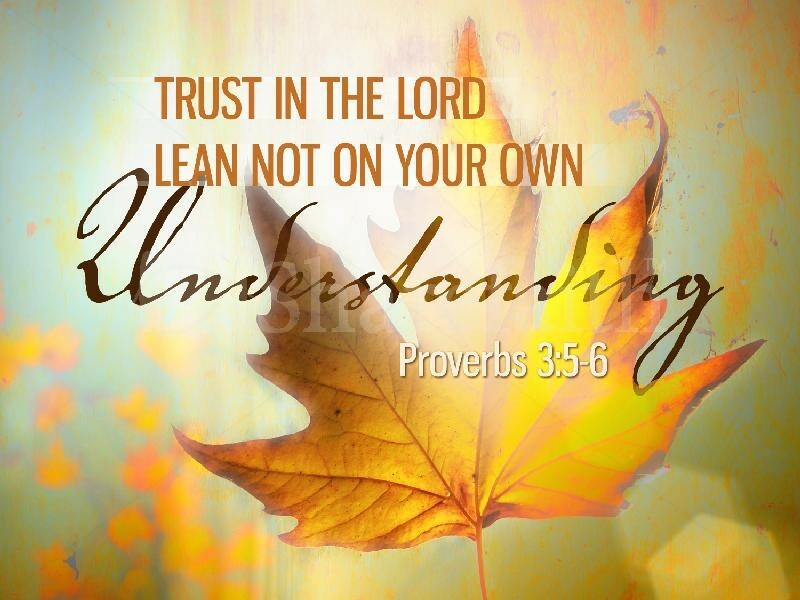 Proverbs 3:5,6 Trust in the LORD with all your heart; and lean not unto your own understanding. In all your ways acknowledge him, and he shall direct your paths. Take God at His Word and trust Him. Trust in His son Jesus who laid down his life for you and will raise you from the dead or gather you to himself if you are still alive when he returns. Mankind will never engineer society so all ills are solved. He is only interested in himself and how he can use others to his own ends. Don’t fall into the trap of this distorted vision of mankind at his ultimate. Those at the top are not revealing what they really believe. They aren’t revealing what they are truly after. Jesus has revealed God’s will to us and it only is good. Trust in the Lord and you will do well as we await for our Lord Jesus from heaven. Be thankful for what God has done and continues to do. Jesus is the rock of ages and my friend, I’m standing firm. I’m rockin’ on in Christ. Romans 10:9,10 If you confess with your mouth the Lord Jesus and believe in your heart that God raised him from the dead, you shall be saved. For with the heart man believes unto righteousness, and with the mouth confession is made unto salvation. John 146:3 Put not your trust in princes, nor in the son of man, in whom there is no help. What sound advice! Putting our trust in anyone or anything other than God our Father and our Lord Jesus Christ often leads to disappointment. We have to trust some of the people some of the time but you can always trust God! Sorry, I think my mind reverted to my mom’s good advice… Trusting God never disappoints because what God has promised, He will do. What He has said, will come to pass. God does not change and His Word will do what He’s purposed it to do; it will not return void. Trusting in people is a natural tendency. We want to believe people are honest and trustworthy. We don’t want to have to be ‘on our guard’ all the time. We naturally assume people are basically good and that they can be trusted. We want them to be trustworthy so much that we often lend trust to people who don’t deserve it. While you grow up you learn to trust your parents and immediate relatives. You make friends and you trust your close friends. As long as someone doesn’t cross you, your natural tendency is to have at least an inclination of trust toward whoever you meet. We call people gullible who fall for something because they trusted someone with what they were saying. Being gullible is just a left-over from our wanting to trust people. The problem is not in the person trusting the thief or schemer, but in the thief or schemer. No matter how good a country seems to be, no matter how much integrity the leadership of a country appears to have, I must warn you not to misplace your trust by trusting in man’s government. You will be disappointed just as when you trust in people who don’t keep their words, people who don’t do what they say they will do. In free countries we want to believe in our government and its leaders. We want to think everything is good, full of integrity, and interested in our own good. We want to believe our government leaders are honest, don’t have private agendas, and really care about their constituents. It’s our natural tendency to trust our government because who wants to live in fear of their government all the time? We want to think all is OK and is getting even better. But how many times have we been disappointed by our government? How many times have politicians campaigned to do a certain thing but after the election they never do it? Too often. Our current president promised way more than he has delivered and it’s even come out that at times lies were told to get the American public to accept the Affordable Health Care Act. We were disappointed. Something major got shoved in our faces under false pretense. Most Americans are beginning to realize what a con job the passing of this act was. Trusting in government figures is always disappointing. Wherever there is power and money involved, the devil is hard at work manipulating people and pulling the strings behind the scenes. He is the ‘god of this age’ and he’s having a field day in governments across the world. But our Lord Jesus Christ is watching, and soon he will return to bring in his righteous kingdom of God on earth where righteousness reigns. Trusting in the Lord is different. Our Lord is honest, trustworthy and is always after your own good. He gave his life for you already, why would he do less now? He loves and cares for his brothers and sisters in his body. He wants each of us to win, to bear much fruit and that our fruit will remain. All he asks is for us to trust in him and live as he wants us to live. He wants us to grow in his character, love and power. Proverbs 3:5,6 Trust in the LORD with all your heart; and lean not unto your own understanding. If you want your paths in life directed by the Lord Jesus Christ, it’s time you start trusting him and acknowledging him in all your ways. That’s a very important key! Our ways have to change where they are not in line with God’s ways. Our will has to change where it’s not according to God’s will. Acknowledge the Lord by changing those things that disagree with God’s Word in your life and lean not on your own understanding. This is what trusting the Lord is all about. Trusting the Lord requires us to change our ways to His ways. Isaiah 55:89 For my thoughts are not your thoughts, neither are your ways my ways, says the LORD. God is amazing, Our Lord Jesus Christ is amazing. They only have good plans for us and they want us to be successful both in this life and in that which is to come. Trust what God says in His Word and walk out on what he directs you to do, walking with our Lord Jesus all the way. Psalm 37:4 Delight yourself also in the LORD; and he shall give you the desires of your heart. Trusting the Lord is like planting a seed in a good soil. The seed just needs a bit of water and it shoots up with it’s own life within itself. Trust in the Lord — plant the seed. Nourish that seed with the water of God’s Word and watch how God causes you to grow from the life He’s placed within you.